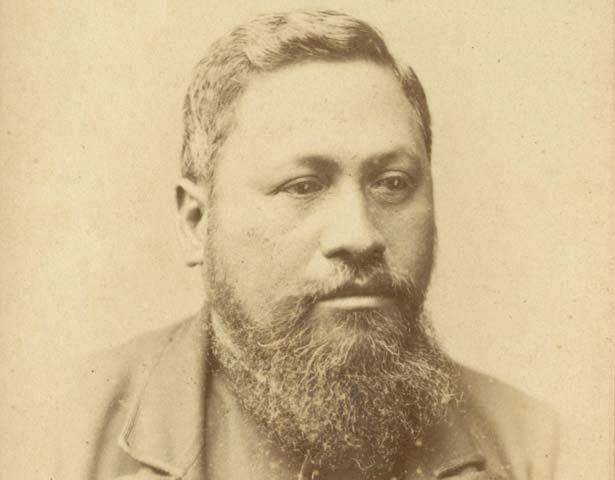 Hōne Mohi Tāwhai was born in the Hokianga in 1827 or 1828. He was about 12 years old when his father signed the Treaty of Waitangi, and he became a leader early in life. In the 1860s he was involved in a district runanga (tribal council) set up by Governor Grey. Later he was made a Native Land Court assessor. By the mid-1870s he became disillusioned with the Native Land Court and began to call for Māori control over land title and land alienation. Tāwhai became a member of the House of Representatives, representing Northern Māori, in 1879. He debated effectively on a number of race relations issues. In 1881 and 1882 he promoted a Native Committees Bill to limit the power of the Native Land Court, and give Māori control of awarding land titles. The government sponsored a heavily modified version of the Bill – the Court was to do no more than take account of Native Committee recommendations. In fact, the Court paid little heed to the few underfunded Native Committees, and they had virtually no impact. Tāwhai left the House in 1884. By the end of the decade he no longer believed the settler-dominated Parliament would uphold Māori rights and the Treaty of Waitangi. Accordingly he began to support Māori political movements. Among other things, he helped set up the Māori Kotahitanga Parliament, which first sat at Waitangi in 1892. The Kotahitanga movement advocated the abolition of the Native Land Court and all Maori land laws, and implementation of the Treaty of Waitangi. Tāwhai died in July 1894. I whānau mai a Hōne Mohi Tāwhai i te tau 1827, 1828 rānei ki Te Hokianga. Tekau mā rua pea tōna pakeke ka hainatia e tōna matua te Tiriti o Waitangi. Kāore noa iho i roa ka tū a ia hei kaiārahi o te iwi. I te tekau tau atu i 1860 kei roto ia i tētahi rūnanga he mea whakatū nā Kāwana Kerei. Whāia, ka whakaingoatia a Tāwhai hei āteha mā te Kōti Whenua Māori. Kia tae ki te pokapū o te tekau tau atu i 1870 kua kore a ia e whakapono ki te Kōti Whenua Māori, kua karanga kē ia kia hoki te mana o ngā whenua me te mana hoko ki te Māori. I te tau 1879 ka kuhu a Tāwhai hei Mema Pāremata Māori mō Te Tai Tokerau. Kāore i ārikarika tana kuhu ki ngā tautohetohe e pā ana ki te noho a ngā iwi. I ngā tau o 1881 me 1882, nāna i kōkiri tētahi Pire Whakamana i ngā Komiti Māori e mea ana ki te here i te Kōti Whenua Māori, ki te tuku ki te Māori te whakataunga o ngā taitara whenua. Ka nui ngā whakarerekētanga, kātahi anō te kāwanatanga ka tautoko i te pire e mea ana me aro noa iho te Kōti Whenua Māori ki ngā tūtohu a ngā Komiti Māori. Otirā, kāore i tino aro atu te Kōti ki ngā tūtohu a ngā Komiti Māori nei e mate ana i te kore pūtea. He komiti ēnei kāore he niho. I te tau 1884 ka wehe a Tāwhai i te Pāremata. Kia tae ki te paunga o taua tekau tau, kua kore ia e whakapono ka puritia tonutia te mana o te Tiriti o Waitangi me ngā tika a te Māori e te Pāremata kikī ana i te Pākehā. Whai anō ka huri a ia ki te tautoko i ngā kaupapa tōrangapū a te Māori. Nāna i āwhina te whakatūnga o te Kotahitanga, te Pāremata Māori e whai ana kia whakakāhoretia te Kōti Whenua Māori me ngā ture whenua Māori, kia whakamanatia hokitia te Tiriti o Waitangi. Ka mate a Tāwhai i te marama o Hūrae i te tau 1894. We have 40 biographies, 7 articles, related to Hōne Tāwhai.